A very attractive ginger with, as the common names suggests, wavy 'pleated' margins to the leaves. Small hairs on the underside of the leaf produce a beautiful soft, velvety feel. The other common name of 'snowflake ginger' alludes to the pretty white flowers that are produced at the end of the main pseudo-stems. The flowers have a yellow centre and are reported by Nicholson and Nicholson (1995) to be the biggest flower of any Australian ginger. These are followed by an unattractive collection of fruits that are at first green, then turn into what looks like small brownish-gray bananas. The many small seeds and their flaky white surroundings can be nibbled, but are not considered particularly edible. 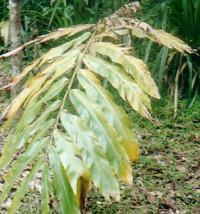 This plant is found in gaps on the edge of tropical rainforest in north Queensland (Nicholson and Nicholson 1995).